or “Sun-Glo” shrinkproof crepe wool, shade No. 2195 (Maize). 1 pair old UK No. 12 / US 2 / Metric 2.75mm needles. Length from top of shoulder 20 inches. Length of sleeve seam 5½ inches. NOTE: For 36 inch bust, use old UK No. 9 / US 5 / Metric 3.75mm instead of old UK No. 10 / US 3 / Metric 3.25mm needles. 7 sts. 1 inch. 12 rows 1 inch. Using smaller needles, cast on 95 sts. Work as follows, working 1st row into back of sts. 1st Row (wrong side): K1, * yo, sl 1, k1, repeat from * to end. 2nd Row: * K1, k2tog tbl, repeat from * to last st, k1. Repeat the last 2 rows for 3½ inches. Change to larger needles, and continue in pattern, increasing 1 st each end of every 6th row until increased to 115 sts. When work measures 12½ inches shape armholes by casting off 4 sts at the beginning of the next 2 rows. Work K2tog each end of the next 4 rows, then every 2nd row 4 times. When armholes measure 4 inches work 39 sts, (leave on a spare needle), cast off 13 sts, work 39 sts. Continue on last 39 sts and k2tog at centre back edge every row until decreased to 3 sts. Join wool and work the other side to correspond. 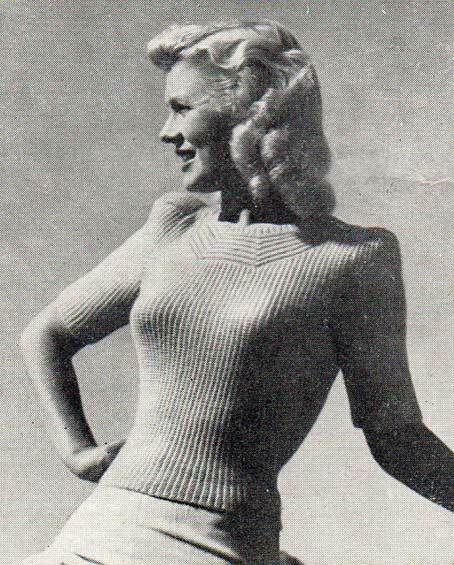 Work the same as for back until armhole measures 2½ inches. Next Row: Work 33 sts, (leave on a spare needle), cast off 25 sts, work 33 sts. Continue on last 33 sts and k2tog at centre front edge every row until decreased to 18 sts, then every 2nd row until decreased to 3 sts. Join wool at centre front and work other side to correspond. Join the 3 sts of each shoulder. Work backwards and forwards on these sts. P to end of row, cast on 4 sts. 4th Row: P to last 4 sts, k4. 12th Row: P to last 4 sts, k4. 16th Row: P to last 4 sts, k4. 20th Row: P to last 4 sts, k4. Change to smaller needles and work in rib of k1, p1, for ½ inch. Using smaller needles cast on 75 sts. Work the 2 rows of pattern as for basque for 1½ inches (working 1st row into back of sts.). Change to larger needles and continue in pattern, increasing 1 st each end of every 4th row until increased to 87 sts. When sleeve seam measures 5½ inches k2tog each end of every 2nd row until decreased to 47 sts. When work measures 6 inches from 1st decrease, cast off 12 sts at the beginning of the next 2 rows. Work remaining 23 sts. for 11 inches. Stitch the cast off sts. to side of sts. worked for 1½ inches. Using smaller needles cast on 57 sts. Change to larger needles and continue in pattern, increasing 1 st each end of every 8th row until increased to 87 sts. When sleeve seam measures 18 inches or required length, shape the top the same as for short sleeves. Using larger needles, cast on 24 sts. Cast off. Fold in half, pad with cotton wool and sew up edges. Press with a warm iron and damp cloth. Sew up seams, sew in sleeves and shoulder pads. Crochet loops on back opening to form buttonholes. The original publication of this pattern is in the public domain, however the updated text provided here is copyright Sarah Bradberry, June 8th 2013. All rights reserved.